Health experts described inactivity as "one of the biggest" challenges in health. Heart disease, type 2 diabetes, cancers and poor mental health have all been linked to sedentary behaviour. 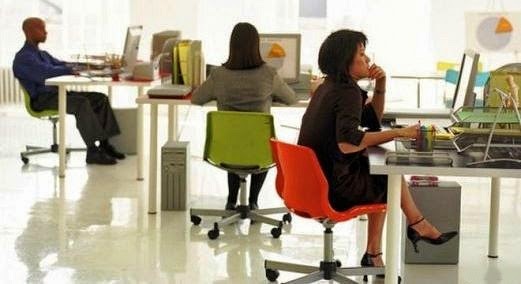 A report says that sitting down all day at work poses a health risk to office workers. According to a new campaign, office workers need to get off their backsides and move around more. On Your Feet Britain says sitting for long periods at work is linked to a host of health problems, which are not undone by working out in the gym. The poor health effect is found even in people who class themselves as fit, such as those who cycle to work, if they also spend long periods of time sitting. The new campaign is calling on people to stand regularly, walk around more and embrace ideas such as standing meetings or standing desks. The campaign is a partnership between the group Get Britain Standing and the British Heart Foundation (BHF) charity. Gavin Bradley, from Get Britain Standing said "We're all victims of our environment, we've taken a lot of activity out of the workplace and we're sitting longer and longer. We need new and innovative ways of addressing the issue. Stand up when you're on the phone or in meetings, do everything you can to avoid sitting." Other ideas including using the stairs instead of a lift, eating lunch away from your desk, taking a break from your computer every 30 minutes and walking to a colleague's desk rather than phoning or emailing them. Get Britain Standing says standing burns an extra 50 calories per hour than being seated. Dr Mike Loosemore, head of exercise medicine at University College Hospital, said "Inactivity and sedentary behaviour is one of the biggest challenges we have in public health today. Compared with 100 years ago, our levels of activity are tiny, the number of manual jobs are continually reducing, even if you dig a road up you sit in a little tractor." Lisa Young, project manager for the BHF's Health at Work programme, said: "We're all guilty of being too glued to our screens sometimes, but these results show just how far the couch potato culture has infiltrated the workplace. 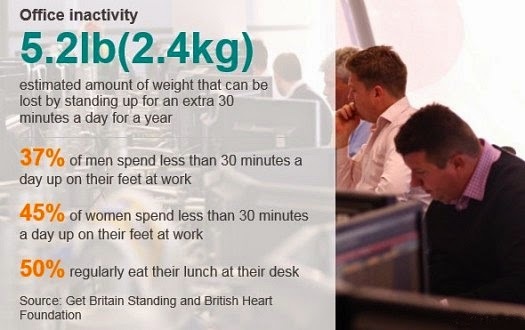 Too many of us are tied to our desks at work, which could be increasing our risk of developing cardiovascular disease." "That's why we want workers to get up and get moving on 24 April and take a stand against cardiovascular disease. A bit of healthy competition in the workplace could go a long way to reversing this trend whilst raising vital funds for our ground-breaking research."